After six straight games, the Canby Cougars were unbeaten, scoring 43 goals versus just six goals scored against. In its final preseason game, the team took a step up in competition to face top-10 team, the unbeaten Barlow Bruins on Tuesday, Sept. 25. Someone's 0 had to go, and it turned out to be Canby's. The Bruins beat the road team 5-2 after 80 minutes of play, dropping Canby's record to 6-1. Barlow improved to 7-0-1 so far this season. "It's no secret that Barlow is a top team," Canby head coach Maria VanAcker said. "They're solid in many areas of the field, and by far our toughest test we've had so far. They posed challenges to us that we haven't seen yet this season." The game started out well enough for the Cougars. Freshman Joeylynn Baguio scored the first goal of the game, giving Canby a 1-0 lead. After that though Barlow took over, scoring five straight goals. 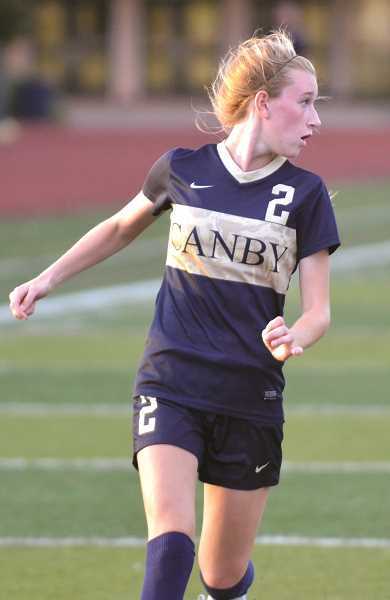 Canby was able to get one back when senior striker Claire Wright scored a penalty kick in the waning minutes of the game. According to VanAcker, the team was understandably disappointed with the result, but resolved to better themselves as its foray into league began. "The girls were upset to lose, but very positive and energized to build on what went well and fine tune what didn't," VanAcker said. "Every day is a learning experience, win or loss. We immediately acknowledged that we had some mistakes during the game, and went right back to work on Wednesday to polish those areas." The team's first league contest will be against the St. Mary's Academy Blues (4-2-1). Last year, St. Mary's went 5-6-4 overall, including 4-3-1 in the Three Rivers League (TRL). Despite the near .500 record from last year, Canby still expects a challenge when they return to Cougar Stadium for the league opener. "St. Mary's is a very disciplined, experienced team," VanAcker said. "We will have to be patient in our defense, and deliberate with our attack to unbalance them. We're looking forward to a good match with them at home to kick off league play." Despite the loss to Barlow, and with the first month of play and practice in the rearview mirror, VanAcker and her coaching staff are still enjoying the journey with the team. "As always, our goal is to improve a little bit every day," VanAcker continued. "The group has far exceeded these expectations. They are thinking about the game in a very different way than they have in the past, thinking about how to cause the most problems for our opponents and they're taking their training sessions to the next level while doing so. It has been such a privilege to be a part of their journey this season and watch them grow and mature as young women on and off the field." Update: Canby was unable to overcome St. Mary's in its first league match, losing 3-2. The Cougars play Lakeridge (3-4) on Thursday, Oct. 4.